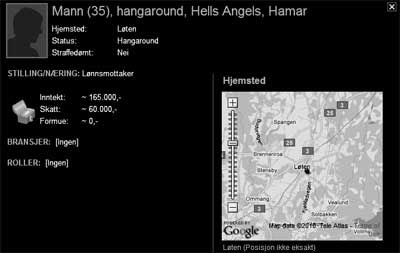 NRK, a Norwegian national television and radio station, are using Google Maps to show the addresses of Hells Angels' club houses in Norway. NRK say that the Hell Angels have a foothold in many Norwegian cities and have therefore created this application to show where the Hells Angels are active. NRK have created a very nicely designed Flash application that allows readers to search for Hells Angels' club houses by province. When you select an individual club house a Google Map loads to show its location. One nice design touch of the site is that the Google Map initially loads in black and white, which complements the overall design of the application. When you roll-over the map it then reverts to the normal Google Maps colour scheme.